In the past, we’ve discussed the benefits of meditation and even some tips on how to mediate for better natural health. But sitting still doesn’t suit everyone well, and sometimes a little movement can bring a struggling meditation practice back to life. Tai Chi is sometimes called “meditation in motion” because it combines gentle movements with mindful mental practices to help maintain balance and strength, both outside and in. You don’t have to subscribe to any certain culture or region to practice Tai Chi, just an open mind and a desire for full-body wellness. Tai Chi is a form of an ancient Chinese health practice known as Qigong, which has been practiced for thousands of years. It was influenced by many philosophers and spiritual leaders and was passed down from teachers to students over time. The energy flow in the body is known as Qi, and the practice of Tai Chi helps balance this energy, acknowledging that the mind and body are interconnected. The other important concept associated with Tai Chi is yin and yang, which are opposing elements that must be balanced to stay in harmony. The purpose of Tai Chi is to balance opposing and complimenting forces of energy in the body to achieve health and wellness of mind, body, and spirit. Practically speaking, it connects the mind and body through controlled breathing, self-awareness, and concentration. This is a low-impact exercise with slow motions that are often circular and keep the muscles relaxed. It is a gentle and flowing style of martial arts that is commonly practiced in time incitements between 10 minutes and two hours long. With very minimal impact on the joints and muscles, this exercise targets your arms, legs, glutes, and back. Tai Chi does not cure the body of any type of illness; however, it does enable the body to heal itself naturally by moving through blockages that impair bodily systems. These are some of the potential health benefits of doing Tai Chi. A beginner Tai Chi class will typically begin with a warm-up that includes easy motions to loosen up your joints and muscles while you concentrate on your breath. From there, you’ll begin sets of movements called short forms. Your instructor may also guide you through breath work or energy work to help relax your mind and channel your energy while sitting, standing, or lying down. Tai chi classes can be held either indoors or outdoors; however, there’s something extra special about practicing Tai Chi in a peaceful setting out in nature. Here are a few videos of common Tai Chi moves that you may encounter in a class. It can take some time, reading, and practice to get comfortable with Tai Chi practice, but the more you learn about it, the more you’ll be convinced to give it a try. Along with a healthy diet, natural nutritional supplements and homeopathics, and regular exercise, Tai Chi can help balance your body in some really impressive ways. Give it a try to see for yourself! 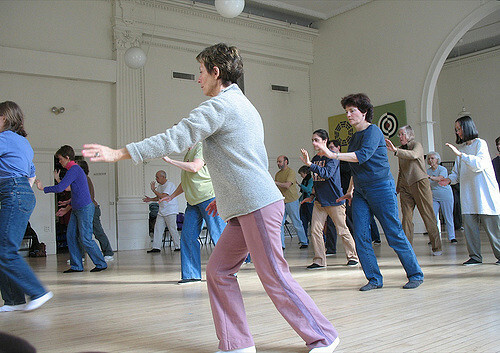 For further reading about Tai Chi, check out these helpful resources.